The annual Children’s Book Festival was launched by the Cathaoirleach of Tipperary County Council, Cllr Phyll Bugler, at an event in Nenagh Library. To the backdrop of the Big Friendly Giant and children from various schools in Nenagh, the monthly programme got off to a soaring start with an 8 foot giant! October is national Children’s Book Festival month, the biggest celebration of books and reading for children in Ireland. In County Tipperary, the Library Service has organised a programme of events that includes authors, illustrators, writing workshops, storytellers and even dance. We have forty-six events planned across the month of October, from break-out author Dave Rudden, who has written the Knights of the Borrowed Dark series, to the well-known Roisin Meaney who will run writing workshops. We continue our support of Irish authors with a three-day visit from Cork author Kieran Crowley and from Galway, Patricia Mac Eoin. We’re excited to work with Tipperary Dance Platform again, bringing dance to the library and a younger audience. 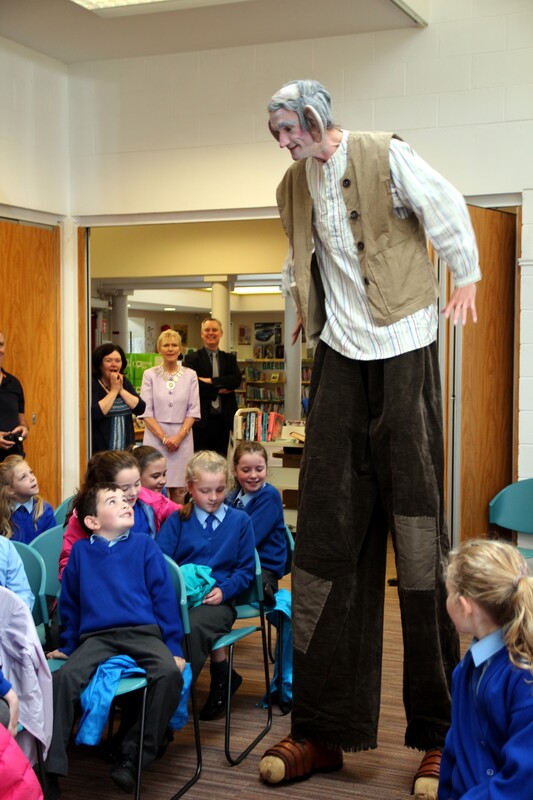 Thanks to Arran Towers, stilt-walker and storyteller, for bringing the BFG to the launch of the Children’s Book Festival in Tipperary. The Children’s Book Festival encourages children to enjoy the experience and magic of reading. Each year the library service organises events to which schools are then invited. Thanks to the schools, teachers and pupils who support the festival. The Children’s Book Festival is made possible due to funding from Tipperary County Council Arts Office, Foras na Gaeilge and Creative Ireland.